On July 9th, 10th and 12th, Carlos Santana performed three distinctly different music programs featuring his core band of world-class musicians, with invited guests that defined each of their musical categories. Santana was at the height of his game! Carlos owes so much to Armando Peraza that he insisted on this percussion great, now 90 years old, performing at this historic event. The July 9th program was devoted to the African artists to whom I have listened for years -- and who, Santana continues to remind us, are the source of his music. Unlike other mega-stars who have a musical director rehearse their band, Carlos Santana spends endless hours without a break rehearsing to assure his devoted fans that they will have a great show. A typical rehearsal ran for seven hours, and I am proud to say that I was allowed, with my family, to attend each of these historical music-shaping events. 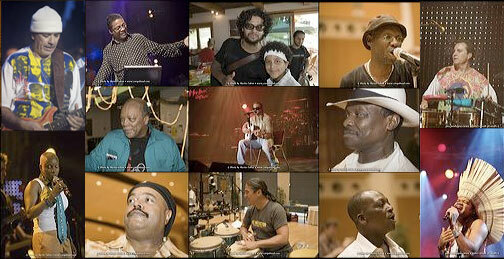 The Santana band rehearsed some 65 tunes for the Montreux Jazz Festival. I offer for the world to see the events that took place in Montreux, including my visit to the chalet of festival director Claude Nobs.